Grace has always gone with me to games. I think her first one was a volleyball match between Hillsboro and Litchfield just a few weeks after her birth. I had some help on that one - my brother Shane, who watched her and batted away a loose ball that made its way up into the stands, while I was on the floor with my camera. Regardless of the sport or the season, Grace was there. A brisk October fall football game? There. A late February postseason basketball game? There. An extra-inning college baseball game that ended around midnight? Yup, there too. That one was with Grandpa and Grandma Herschelman though. Grace was often a constant companion on trips to watch Uncle Shane play baseball for Maryville University over the last three years. Usually she just went along for the ride, happy as can be to be with people that she loved and who loved her more than anything. Sure she would get fussy sometimes and more than once Daddy had to hope that he got a decent shot in the first few minutes because a camera in one hand and a baby in the other isn't a recipe for journalistic success, but overall she has been outstanding. Of all the sports, I think my favorite to watch live with Grace is basketball. At home, we are much more of a soccer and baseball family in regards to our viewing habits and our play. "Ball" has always been in our vocabulary, whether we were pretending to score the game winning goal in the 2027 Women's World Cup or gunning a runner down at home plate with a pinpoint throw, but as far as in person viewing, basketball takes the cake. I remember bits and pieces of the first high school basketball game that we took her to. She would have been about four months old and Mary and I sat with my parents and Shane on the far side of the Nokomis High School gym, watching the Redskins take on my alma mater, Lincolnwood, for the 79th time in the history of the two schools. Admittedly, I didn't remember the score, probably because I had subconsciously blocked out the 50-point thrashing the Redskins handed out to the Lancers, one of the most lopsided losses in a rivalry that is nearly as lopsided (Nokomis holds a 64-21 advantage all-time). What I do remember is how excited I was to share something that I love so much with my little girl. Decked out in an orange and black tutu, which works for both my alma mater and her current home district of Hillsboro, Grace looked adorable, even if she did sleep through much of the game on my mom's lap. 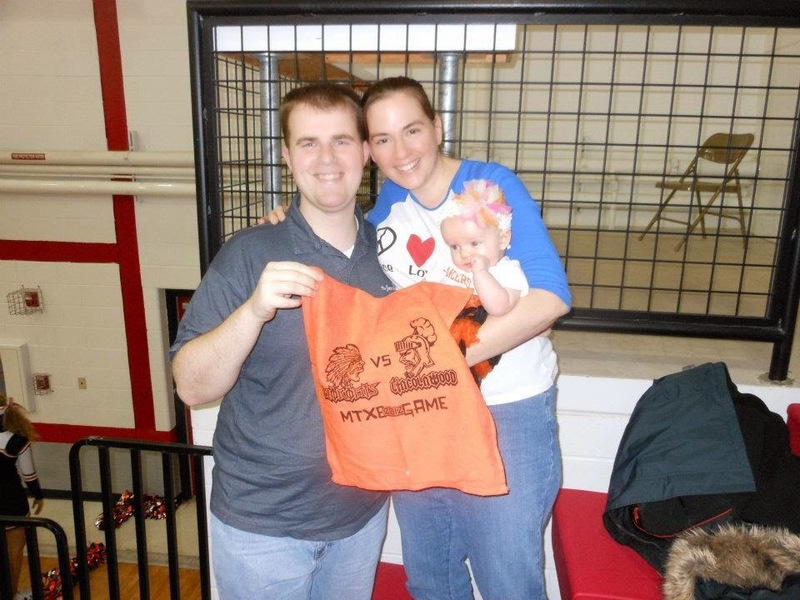 This was taken at Grace's very first high school basketball game when Nokomis hosted Lincolnwood in January 2012. We still have her orange fan towel. I remember thinking how cool it would be to have her sitting next to me five years from then, coloring away on the bleachers, or even better 15 years from then, taking stats for her daddy while he gets an action shot or two. The choice to make the Nokomis/Lincolnwood game Grace's first wasn't by accident either. Watching the Lancers and Redskins battle things out in the Mohawk Classic championship game when I was in junior high and high school are what got me hooked on high school athletics. When it was time to introduce Mary to my parents, I chose a Nokomis/Lincolnwood game as well, saying "This is Mary. She has poor taste in men." A statement that still holds true. And on Friday, Jan. 9, a new chapter was added to my family's story that is intertwined with that rivalry. Before the game, Lincolnwood Head Coach Matt Millburg, who was just a few years behind me in school, handed me a basketball, covered in the familiar scene of black Sharpie scribbles. "All the guys from the alumni tournament signed it for Grace," Matt said. "We appreciate all you do." It's a ball. But it's not. It's more. There are signatures, just names. But they aren't just names. They are way more than that too. 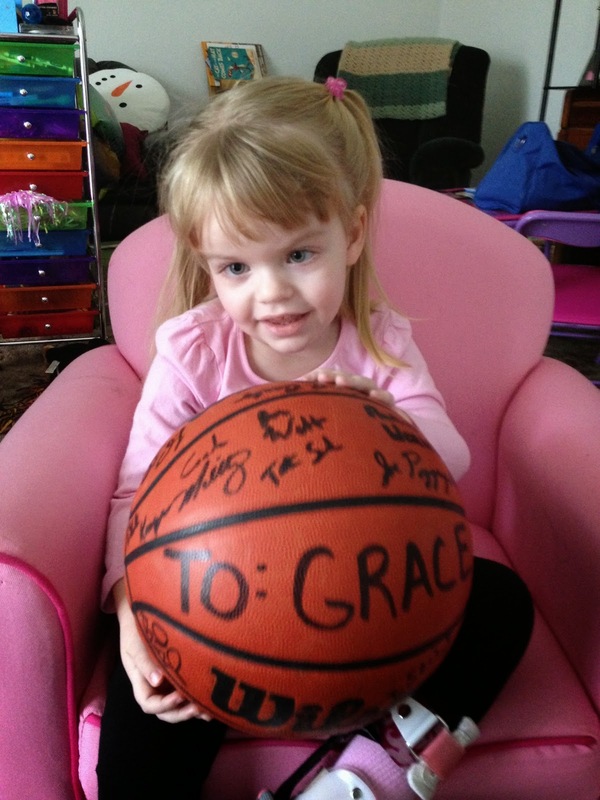 Grace loves her basketball signed by players in this year's Lincolnwood alumni basketball tournament. These are guys that I went to school with or my family went to school with or that I have covered during my time at the Journal-News. A lot of them have kids that I will cover somewhere down the line, some of them I already have covered. I'm probably not going to get to cover Grace playing a sport. I know that anything is possible and that if anyone could prove me wrong, it's Grace, but I know the odds aren't in our favor with her recent prognosis. But this ball may be the next best thing. She's part of a team. She's part of a family that is much bigger than just those with the last names of Herschelman or Galer or Armour or Hutson. People from every corner of the county have sent us words of hope and support through this Grace-filled journey that we are on. And we need everyone. Sometimes it's hard not to get down. I've had to stop writing this column three times before pushing forward. But I know, regardless what happens, I'll have that ball. And I'll know that I have an endless line of support behind me, through good times and in bad.